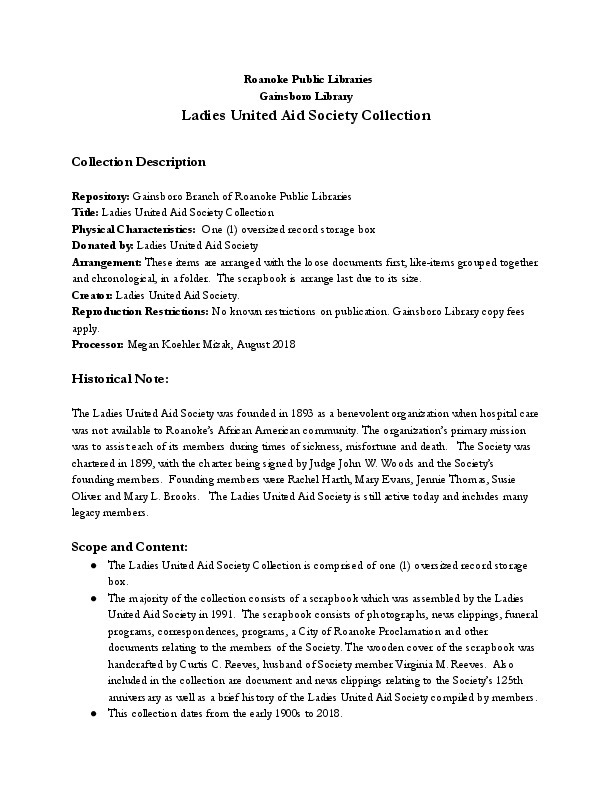 This is a guide to the Ladies United Aid Society Collection. The collection contains items relating to the Ladies United Aid Society and their members, including documents and a scrapbook. In 1893, the Ladies United Aid Society was founded as a benevolent organization when hospital care was not available to Roanoke’s African American community. The organization’s primary mission was to assist each of its members during times of sickness, misfortune and death. The Ladies United Aid Society, “A Guide to the Ladies United Aid Society Collection,” Virginia Room Digital Collection, accessed April 19, 2019, http://www.virginiaroom.org/digital/document/LadiesUnitedAidSocietyCollection.